As Cycle Oregon continues to work on spreading more bike love throughout Oregon, we’re excited to announce that we’re going to get a little more dirty this year and have joined up with Mountain Bike Oregon to be their 2019 title sponsor. As title sponsor, Cycle Oregon will partner with Mountain Bike Oregon to provide financial support and 30-plus years of logistical experience. Together, the two organizations seek to strengthen the cycling-focused festival and the economic benefit it provides for the communities of Oakridge and Westfir. 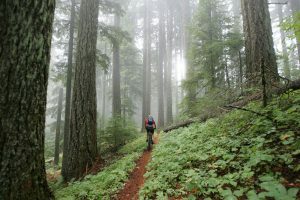 One of the country’s premier mountain biking events, Mountain Bike Oregon will this year be held July 19-21 in Oakridge, Ore. Now in its fifteenth year, the festival features three days of fully-supported single-track riding in the Willamette National Forest for mountain bikers. 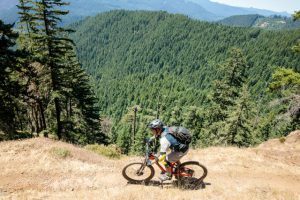 Mountain Bike Oregon has consistently been named in the Top 10 Mountain Bike Festivals in the country, helping raise awareness about the world-class mountain biking trails around Oakridge. The Central Oregon town about 45 miles east of Eugene was recently designated a Gold Level Ride Center by the International Mountain Bike Association (IMBA), which recognized the town for its extensive trail network, masterfully designed for mountain bikers of every skill level, and built by professional trail builders and local volunteers. Oakridge is one of only 6 Gold Level Ride Centers in the world. 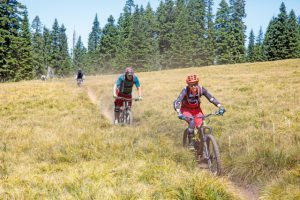 Mountain Bike Oregon offers three days of fully-supported rides for mountain bikers of varying levels, a centrally located group camp site, breakfast and lunch, an all-inclusive beer garden, food carts for dinner, and nightly entertainment. Registration is now open at mtboregon.com. This isn’t the first time Cycle Oregon has partnered with other cycling events. Over the years, the organization has helped support events such as The Gorge Ride, Ride for Two Rivers, Sisters Stampede, the Oregon Active Transportation Summit and the Policymakers Ride, among others. What level of mountain biking is this?? I am a beginner /intermediate. Don’t like to technical. The trails in Oakridge are mostly geared towards the intermediate to advanced level rider, however MBO is offering a Ladies clinic this year which is for the beginner to intermediate level rider. This supportive clinic will teach you new skills, freshen up the skills you possess & give you the knowledge & confidence to ride more trails! Check out http://mtboregon.com/#clinics for more information!